The ubiquitous Mr. Leslie (Eddie Paskey) appeared in several dozen episodes of Star Trek over the course of the show's three seasons, including the second pilot, "Where No Man Has Gone Before." The strange - or perhaps exemplary - thing about Mr. Leslie is his ability to perform a wide variety of duties. He's served as a bridge officer (usually manning the engineering station, but also as a navigator and helmsman), he's been on landing parties, served in sickbay, acted as a security guard and even sat in Kirk's chair on one occasion. He's worn blue, gold and red shirts. Oddly, even though he's usually referred to as "Mr. Leslie" or "Lieutenant Leslie," he's also been called "Connors" and "Rand" (no relation to Yeoman Janice Rand, presumably). Furthermore, Leslie's Lieutenant stripes appear and disappear at seemingly random intervals. In one episode - "Space Seed" - he appears in two places on the ship at the same time. 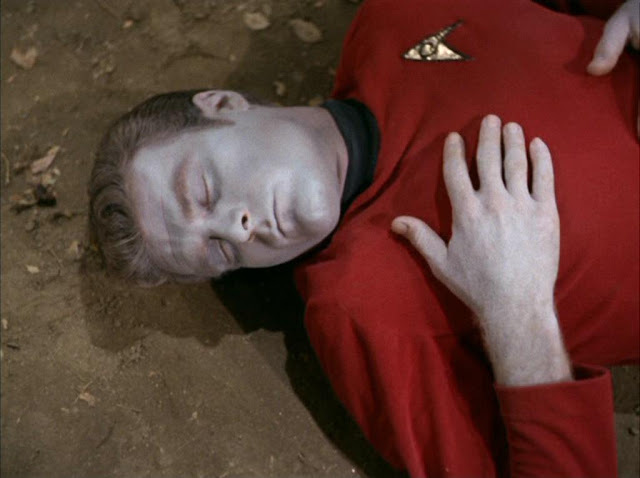 And in "Obsession," he dies - only to reappear in many later episodes. Behind the scenes, these anomalies are no great mystery: the producers simply used Eddie Paskey as a recurring actor and didn't pay much attention to the character's continuity (or lack thereof). But if we treat the world of the show as real, we must come up with an explanation for these incongruities. My answer is this: Mr. Leslie is a new breed of human, a distributed intelligence: one mind inhabiting many bodies. This explains why one version of Mr. Leslie can appear in two places at once, and why he's still around even after he dies - it was just one body that got knocked off. His differences in role and rank can be explained by his immediate superiors advancing different iterations of Mr. Leslie at different rates (perhaps irrationally, since he's just one person in many bodies - but on the other hand, maybe Leslie is a better engineer or navigator than he is a security guard, for example). While Mr. Leslie is, to the best of my knowledge, the background character with the most appearances in the show, there were other players who could also be explained as distributed intelligences: Angela Martine, for one, who's also referred to by more than one name over the course of her appearances on the show. Of course my musings here are nowhere near canonical, but I think it's a pretty cool explanation for one of the show's inconsistencies - and I think a real writer could turn this into a pretty neat character with all kinds of interesting stories. Imagine if in, say, Star Trek: Discovery, there was a character of this nature featured as one of the main cast. What would it be like to experience life as a distributed intelligence? How would relationships work? How traumatic - if at all - is it when one of the bodies suffers injury? Would "normal" humans feel threatened by a distributed intelligence, would could take up many of the available berths on a starship? What prejudices could they face? Would a captain be tempted to send in an iteration or two as cannon fodder in a dangerous situation? Introducing a character like this would also give some insight into Earth's future, about which little has been said in the Trek shows, other than that it's a utopia. But what sort of utopia? What new forms of diversity might appear in the 22nd or 23rd centuries? Something worth exploring, I think. Leslie Thompson's upcoming marriage to Mr. Leslie was interrupted by her unfortunate participation in the Kelvin Weight Loss Program, a tragedy, although Zefram Cochrane's gain I guess. 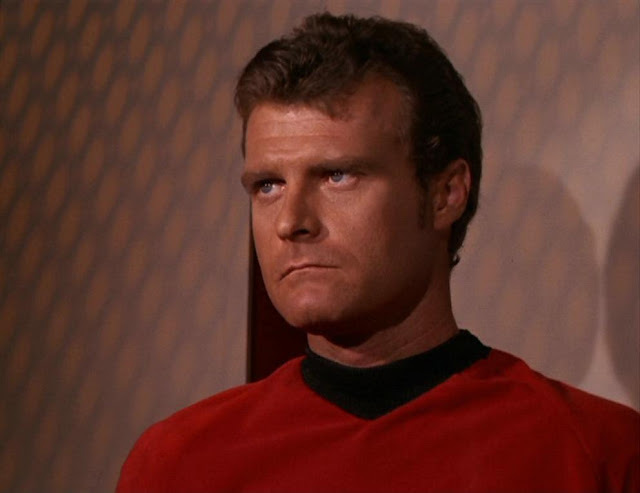 I thought that Billy Blackburn would have had more appearances on Star Trek than Eddie Paskey, although unlike Mr. Leslie, the variety of Mr. Blackburn's characters never got speaking lines or even names. Sorry Earl, I don't buy it. It doesn't sound logical. (That's just my attempt at being Vulcan). A simpler explanation is that Mr. Leslie, and Mr. Leslie and Mr. Leslie are all brothers and cousins. That would be why they all look alike and some are dead and others have higher rank. Mother Leslie was quite fecund, as were her sisters. The universe is populated with Leslies who love to serve in Starfleet, sort of like the Sudders and the National Hockey League. You can't throw a brick or puck without hitting one of those boys. Apparently Billy Blackburn was in four more episodes that Eddie Paskey! Good catch. Given that birth rates fall as prosperity increases, and given that 23rd century Earth is portrayed as a utopia, the hypothetical Mother Leslie would be an extremely rare bird indeed. It's a plausible enough explanation, but I think my far-fetched explanation offers richer storytelling possibilities. Good ideas so far but here are a few more for you. Clones (makes losing those redshirts less of a tragedy), a not so horrible transporter accident, a line of starfleet androids to fill out the less important job tasks (obviously look more human than Data but not as smart) . Is This the Next Star Trek Theme?